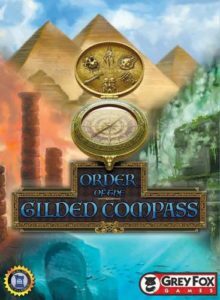 Order of the Gilded Compass is a dice assignment game for 2-5 players. In this game, each player takes on the role of a treasure hunter seeking invitation to join the most prestigious of archaeological secret societies. Players scour the globe to unearth fantastic and valuable artifacts. 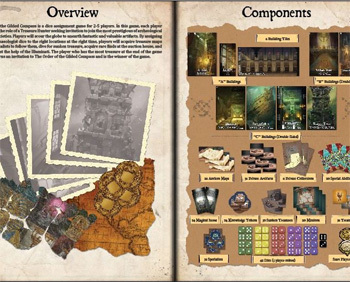 By assigning their archaeologist dice to the right locations at the right time, players acquire treasure maps and specialists to follow them, dive for sunken treasure, acquire rare finds at the auction house, and even enlist the help of the Illuminati. The player who has the most treasure at the end of the game earns an invitation to The Order of the Gilded Compass and wins. Order of the Gilded Compass is a re-issue of the sold out Alea Iacta Est from 2008 with new theme and more game options. » English rules (4,3 MB). » Mission Cards (1,27 MB).